A good computer friend of mine (Tim, the guy who likes the Corsair planes ... see the previous gallery item) got married July 2001 .. we met thru a chat room and, along with others we met in the chat room, still remain in social contact even now, 6 years later. He also met his wife thru the Internet (though not the same chat room). When they announced they were expecting, I knew I wanted to make a special baby quilt for the baby (who is going to be a daughter). Ever since I saw a tesselating star pattern (by Jackie Robinson) done by a quilting friend of mine, I knew I wanted to make it and this was the opportunity. 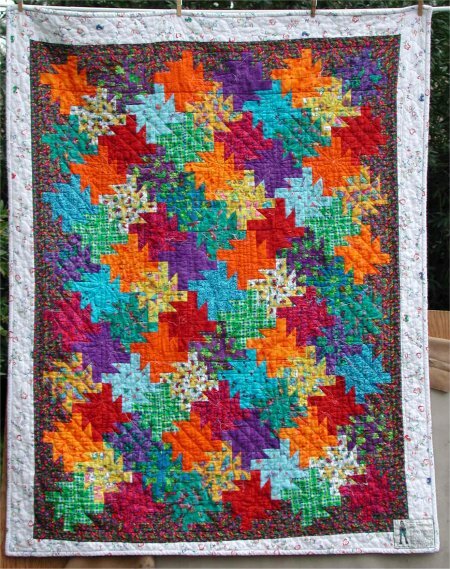 At the time, the fabric market had a marvelous selection of wonderful, velvety flannels in eye-popping brights .. and it was from these flannels that I wanted to make the baby quilt in the tesselating stars. I picked several selections in rainbow colors and with paper and colored pencils, I played around with color placement. The star blocks are 6" finished size and sure are *bright*! For the other side of the quilt, I wanted to do something that reflected the interests of the baby's parents, so she would always know about that part of their lives. Tim was a US Naval officer, so I used US Navy logo fabric as a border. He has also had a long interest in Corsairs, a World War II Navy fighter plane. 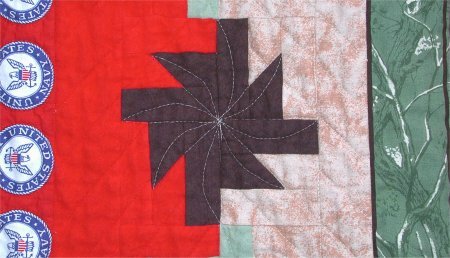 To depict this interest, I copied the outline of the plane and used it as a quilting design in the top and bottom borders. Annette, the mom, has always had an interest in wolves and her online nick is variations on that theme. I was fortunate to find a wolf panel print in earthy tones and decided to use that as a center medallion. From one of my continuous line quilting books, I found a wolf and used that in the top and bottom borders, along with the Corsair quilt design. The challenge was how to transition from the earthy tones of the wolf panel to the red background of the US Navy logo fabric. After studying it for a while, I decided to use the same tesselating stars that were on the reverse side, but would have a "bridging" fabric to go from the earthy colors to the red. The stars themselves were done in brown and moss green with the bridging fabrics of tan and red. To my surprise, I really liked the way it turned out. In fact, as I continued to work on the wolf print side, I realized that I actually like it *better* than the tesselating star side! At the point when I needed to make a decision about quilting, I realized that the wolf side needed to be the front and the tesselating stars would be the back .. exactly the opposite from when I started out. Originally, I had intended on quilting an orange-peel sort of design on the tesselating stars but realized this would really look awful on the wolf side. 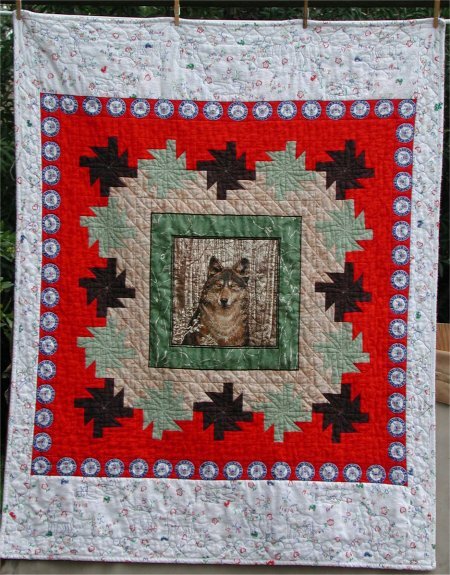 BUT, if used the wolf side as the front and made the quilt design decisions based on that, it wouldn't matter at all to the tesselating star side, since it was so busy with color and prints anyway. I outline quilted the wolf head, stitched in the ditch around the perimeter of the wolf panel, did parallel diagonal lines in the tan and red bridging fabrics (though the diagonal lines slanted left-to-right in the tan and from right-to-left in the red), outlined stitched around the US Navy logos and did that orange-peel sorta design in the stars. For the borders, I wanted something special .. and that's where the designs of the Corsair and wolves came in. They were done in the wide areas of the wolf print side. 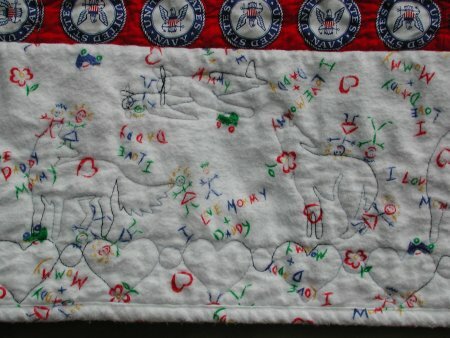 The quilting design around the entire perimeter of the quilt is a series of hearts alternating w/ small circles ... just to show how much this baby was eagerly anticipated and loved.